Just add water! 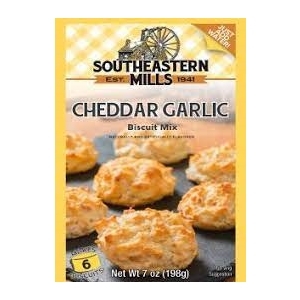 Southeastern Mills Cheddar Garlic Biscuit Mix is restaurant quality Cheddar Garlic Biscuits with cheddar and garlic in the mix! Makes 6 biscuits. Preheat oven to 400 degrees. Combine biscuit mix with water. Mix until soft dough forms. Drop dough by spoonfuls onto lightly greased cookie sheet. Bake 8 to 11 minutes or until golden brown. Bleached enriched wheat flour (wheat flour, niacin, reduced iron, thiamine mononitrate, riboflavin, folic acid), partially hydrogenated soybean and palm kernel oil, leavening (sodium aluminum phosphate, sodium bicarbonate, monocalcium phosphate), wheat starch, cheddar cheese (cultured milk, salt, enzymes, calcium chloride, annatto), salt, dried buttermilk, whey, garlic powder, maltodextrin, dried egg yolks, nonfat milk, oat fiber, natural flavors, parmesan cheese (milk, cultures, salt, enzymes), oat flour, calcium propionate (preservative), mono and diglycerides, soy lecithin, modified corn starch, disodium phosphate, fd&c red no. 40 lake, paprika extract, lactic acid, calcium lactate, autolyzed yeast extract, hydrolyzed soy, wheat, and corn protein, medium chain triglycerides, tapioca dextrin, artificial flavor, corn dextrin. Excellent, you know when the mix comes out of the bag smelling good before you cook it it's going to be good. Great size for toaster ovens. They were inhaled. If you've ever had the biscuits at Red Lobster, these will seem familiar to you - taste just like Red Lobster Biscuits! Be aware though - each bag only makes 6ish!